Keywords: laboratory testing; strike-through; fluid uptake; absorbent dressings; hydrogels; alginates; hydrocolloids. This article was originally published in the Journal of Tissue Viability. An updated version is is reprinted in World Wide Wounds by kind permission of the publishers. Numerous methods have been developed for measuring the absorbency of wound dressings but many are product specific and do not permit comparisons between different dressing types. Existing methods are also of limited value when assessing how a dressing is likely to perform in clinical practice. A new wound model has been developed that overcomes both of these problems. It facilitates direct comparisons between products that are different in structure and composition and provides, perhaps for the first time, a method that may be used to predict the time for which dressings might be expected to remain effective on exuding wounds. The historical background to the introduction of test methods for surgical dressings is briefly reviewed, and the development of the new wound model is described. Some preliminary results that illustrate the potential value of this new technique are also presented. Throughout the centuries, mankind has applied a variety of readily available natural substances to wounds to staunch bleeding, absorb exudate and promote healing. These include honey, cobwebs, leaves and plant extracts, moss and animal dung. In the nineteenth century, primitive absorbent dressings were made by unpicking old rope (oakum) or rags in order to obtain a fibrous mass of flax or cotton fibres that could be used to pack cavities and soak up exudate or blood. Probably the first product to be manufactured specifically for use as a dressing was absorbent lint. This was formed by manually scraping sheets of old linen with sharp knives to raise a fibrous 'nap' on one surface, increasing the absorbency of the cloth but decreasing its tensile properties. With the advent of the Crimean war, the demand for lint increased and this led to the development of more sophisticated production methods involving specially produced new cloth and power operated machinery. This resulted in a more consistent product with, it is assumed, a considerably lower bioburden! An early multi-component absorbent dressing was developed by Dr Sampson Gamgee who used gauze bags filled with oakum. Subsequently he replaced the oakum with cotton fibres to form the now familiar dressing pad that still bears his name. Gamgee had found that although the natural oils and waxes present in raw cotton make the fibres hydrophobic, these may be removed by a scouring or bleaching process rendering the fibres or fabric absorbent. This important discovery resulted in the development of 'absorbent cotton', which has been used in the construction of many types of dressings and wound management materials for over 100 years. Simple absorbent dressings played a major role in wound management for many years gradually being improved by the addition of low-adherent wound contact layers made from perforated plastic films, calendered nonwoven fabrics or other suitable materials. It is only in the last 20 years that absorbent dressings made from polyurethane foam, alginate fibre and carboxymethylcellulose have begun to replace simple absorbent dressing pads in the treatment of leg ulcers and pressure sores. The many new developments taking place in the dressings field around the turn of the century highlighted the need for formal standards to ensure that these products were consistently produced to an agreed of level of quality and performance. The first such standards appeared in two supplements to the British Pharmaceutical Codex (BPC) of 1911 and these were later incorporated into the 1923 edition of this publication. Over 80 products were described, the majority of which consisted of cotton fibre, both medicated and unmedicated, and a variety of cotton fabrics although a number of more complex products such as emplastrums (plasters) and oiled silk were also included. The BPC remained the principal source of standards for surgical dressings within the United Kingdom for over 50 years, but in 1980 these were transferred to the British Pharmacopoeia. At this time, because of new European legislation, standards for dressings in the BP had to be consistent with those of comparable products in the European Pharmacopoeia (EP), although the number of monographs in the EP was relatively small and related mainly to simple products such as absorbent cotton and various types of gauze fabric. The majority of the dressings monographs in the 1980 edition of the BP were reproduced in the 1988 edition, but then a decision was taken that only monographs for the more sophisticated products would be included in subsequent editions of the Pharmacopoeia. When, as a result of further European legislation, dressings became classified as Medical Devices they became subject to a new system of control, governed by European Standards. It was therefore decided that monographs for these materials should be omitted completely from future editions of the British Pharmacopoeia. A review of the dressing monographs contained in the BPC, BP and EP reveals that most are based upon the structure rather than the performance of the products concerned. Structural standards ensure that products that have been shown to meet a specific clinical need are produced in a consistent way from a range of well-characterised materials. The inflexible and restrictive nature of such monographs can, however, sometimes prevent or delay the introduction of new and innovative products. Standards and specifications based upon product structure also do not permit comparisons between the performance of different types of dressings. This has important implications for the marketing of these materials. A cursory examination of promotional material produced by manufacturers of surgical dressings reveals that great emphasis is placed upon the absorbency or fluid handling properties of the products concerned. Although many manufacturers of dressings have developed 'in house' methods for characterising the performance of their products, these vary from simple 'dunk and drip' tests to more sophisticated techniques in which a suitable test fluid is applied to a sample of dressing under controlled conditions. In such tests the total volume of solution taken up provides a measure of the absorbency of the dressing. Companies often present this information in a comparative way to demonstrate that their particular product is able to cope with larger volumes of wound exudate than that of a competitor. These data are sometimes of limited value, for the differences between products may be small and not clinically significant, or the methods by which the results have been generated are inappropriate or not disclosed. This problem has been partly, but not entirely, addressed by the development of new performance-based standards and test methods for some product groups. In the case of hydrocolloid dressings for example, whilst these products vary in structure and composition, they have a number of features in common which can be measured using a range of laboratory tests. These include the moisture vapour transmission rate (MVTR), fluid handling properties, gelling characteristics and conformability . A monograph for a `Semipermeable Hydrocolloid Dressing' was included in the 1996 addendum of the 1993 British Pharmacopoeia  and the test methods it contains will soon be issued as part of a new European standard. Alginate dressings, because of their different physical structure, cannot be examined using these tests so alternative techniques have been devised to characterise these materials. These include methods for assessing gelling, wet integrity and fluid handling properties . As with the hydrocolloid dressings, these methods became officially recognised when alginate fibre  and alginate dressings ,  gained monographic status in the BP. With hydrogel dressings the problems are more complex as these materials are able to absorb or donate liquid according to the condition of the underlying tissue. Test systems have therefore been developed in which samples of the dressing are placed in contact with other gels made from varying concentrations of agar or gelatine. The transfer of liquid to or from the test sample to the standard gels is measured by the change in weight of the sample and this provides a measure of its 'fluid affinity' , . The test methods are specific to the individual product groups. For example they cannot be used to compare the fluid handling properties of alginates with those of hydrocolloids or any other dressing type. The tests are of limited value in predicting how the dressings will perform in vivo. An alternative test system or wound model is therefore required which may be used to address both of these problems. Over the years numerous methods for measuring the absorbency of wound dressings have been devised most of which consist of variations on a common theme. The dressing under examination is placed on a simple wound model, which usually consists of an acrylic plate with a small hole or depression in the centre. A weight is then applied to the back of the dressing to simulate the pressure applied by a bandage and test fluid is applied to the dressing through the plate by means of a peristaltic pump or syringe driver . In some test systems the fluid is not actively pumped into the dressing but is absorbed by the dressing itself from some form of constant head apparatus . In one early system the distribution of liquid absorbed by the dressing was monitored electronically by means of sharp steel spikes which penetrated into the body of the dressing (see Figure 1). The disruption caused by the spikes to the structure of the test sample cast doubt on the validity of this method and so it was abandoned. The absorbent capacity of a dressing is generally taken to be that volume of fluid taken up at the time at which strike-through occurs. Strike-through is defined as the point at which absorbed fluid reaches the outer surface or edge of a dressing and this may be determined in a number of different ways. The simplest method of detecting strike-through is to monitor the test continuously until liquid is detected visually on the outer surface of the dressing, a process that may be facilitated by the addition of a suitable dye to the test fluid. This technique, although simple, has numerous disadvantages; it is very time consuming, the end point may be difficult to detect, and transport of the dye, if used, may be delayed by a chromatographic effect. In addition, it is obviously not easily possible to apply a weight to the back of the test sample to simulate pressure, as this will prevent visual inspection of the surface of the dressing. In recent years a number of laboratories have together evaluated various forms of electrical systems for detecting strike-through. Most of these systems depended upon the measurement of a change in electrical resistance between a metal plate placed on the outer surface of the test sample, and a second electrical contact, usually located at the point at which the test solution is applied to the dressing. Within our laboratory, many different measurement techniques have been tried. These range from the use of a simple galvanometer (see Figure 2), to a computerised system that compares the measured resistance with that of a predetermined standard resistance in order to produce a simple indication of the time of strike-through. Despite their theoretical advantages, all these systems have proved troublesome to calibrate and use. The total amount of fluid absorbed by a dressing may similarly be determined in a variety of different ways. In the most simple test system, the dressing is simply weighed before and after the test to determine how much fluid has been absorbed. If the test fluid is contained in a calibrated tube or burette, the volume of fluid absorbed may be obtained directly from these readings. If the test solution is applied by means of a peristaltic pump or syringe driver, the volume applied may be calculated from the duration of the test and the flow rate provided that this is first accurately measured. Alternatively, if the wound model or fluid-supply system is mounted on a balance, fluid uptake may be indicated by a change in recorded weight. In one highly sophisticated technique a video camera linked to a computer was used to measure changes in the thickness of hydrocolloid dressings as they absorbed liquid . Whilst simple techniques for measuring absorbency have been widely used and undoubtedly still have a place,they suffer from a series of disadvantages. They can be difficult to automate and therefore may not always be suitable for running unattended over extended periods. The application of a weight and/or strike-through detector on the back of the dressing prevents the loss of moisture vapour, an important mechanism by which some dressings cope with exudate production. If moisture vapour transmission is to be measured, it is not possible to apply a weight or strike-through detector on the back of the dressing to simulate the effect of pressure. The use of a positive feed system for the application of test fluid can produce anomalous results. For example, a hydrocolloid dressing that is firmly stuck to the acrylic sheet may appear to be capable of absorbing large volumes of test solution when in fact this is simply being trapped under the dressing in the form of a huge bubble. Most simple test systems provide a single value for the total absorbency of a dressing with little indication of how the product performs over a specified period of time. Many wound models are not suitable for testing hydrogels or packing materials. Existing test systems do not readily enable predictions to be made of clinical wear times of different types of dressings. The objects of the current study were as follows. To design and build a new wound model that may subsequently be used to produce clinically relevant information on the fluid handling properties of modern wound dressings. Specifically the method should facilitate comparisons between dressings of different times and provide an indication of anticipated wear time on wounds exuding at different rates. Taking account of the above, a series of key design criteria for a new wound model was identified as follows. The test system should reflect the normal clinical use of the material under examination so far is as reasonably practicable. Fluid should be provided to the test sample by some form of pump or other suitable positive flow device. A passive uptake technique is not acceptable. The fluid should not be presented to the test sample under excessive pressure. There must be some suitable method for controlling the temperature of the system for the duration of the test. The test should provide some indication of the dynamic performance of the dressing. The equipment should be capable of delivering test solution at a range of different flow rates. This is required to enable products to be tested at low flow rates to simulate clinical conditions or permit tests at higher flow rates when large numbers of products are to be examined in a relatively short period of time for quality control purposes. The apparatus should indicate when either vertical or lateral strike-through has occurred. The apparatus should be suitable for testing a wide range of different types of dressings to permit direct comparison of the results. The equipment should be compatible with a range of different test solutions. Where appropriate, the apparatus should permit the application of varying loads to the test samples in order to determine the effect of external pressure. The apparatus should permit the measurement of moisture vapour transmission by the dressing during the course of the test. The test should be easy to perform and provide reproducible results. The equipment should not be excessively expensive to produce. The test should provide an indication of the weartime of a dressing in normal clinical use. In addition to the primary design criteria, a number of additional features were identified which although not essential, are considered desirable feature in a wound model. The apparatus should withstand sterilisation or disinfection. The apparatus should permit analysis of wound fluid that has been in contact with the dressing to measure changes in ionic composition or changes in concentration of solutes such as proteins caused by selective absorption by the dressing. The apparatus should permit microbiological examination of the local environment during the course of the test. 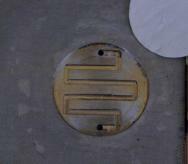 The test equipment should allow the pressure beneath the dressing to be varied if this is considered desirable. A new test system was developed based upon the design criteria identified above. This consists of a number of separate components. The central part of the test apparatus consists of a stainless steel plate 200 mm x 200 mm, mounted horizontally, bearing a central circular recess 2 mm deep and 50 mm diameter. 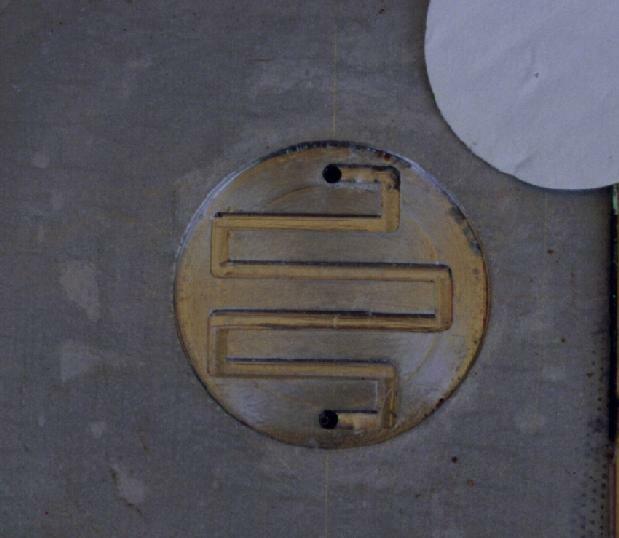 In the base of this recess is a narrow channel 1.25 mm deep that forms a convoluted path between two ports that open onto the lower surface of the stainless steel plate (see Figure 3). Stainless steel was chosen in preference to acrylic sheet because it is stronger, resists scratching, may be sterilised if required and is unaffected by organic solvents which may be used to remove dressing residues from the surface. Test fluid fed through one of the ports by means of a syringe pump, travels along the narrow channel and out through the second port, falling vertically down through a short wide-bore tube. This tube discharges into a glass receiver placed upon the pan of an electronic balance. 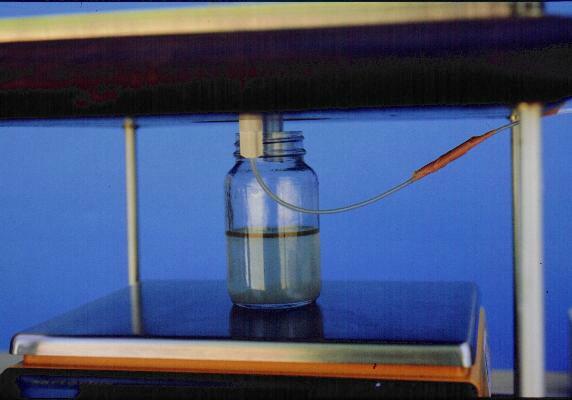 The liquid in the receiver is covered with a layer of oil to prevent loss by evaporation (see Figure 4). The balance is connected to an electronic data capture device that records changes in the balance reading at predetermined intervals throughout the period of the test. Readings are generally taken every 3 min, resulting in approximately 900 data points for each test. The wound model together with the syringe pump and balance are placed in an incubator the temperature of which is controlled within narrow limits. 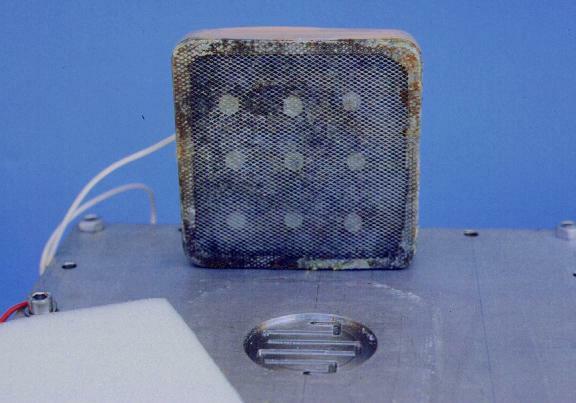 If required, the relative humidity within the test chamber can be maintained at a low level by the introduction of a container of pre-dried desiccant such as silica gel or anhydrous calcium chloride (a low level of humidity is required to allow moisture to evaporate through the outer surface of the dressing under test). Both the temperature and humidity within the chamber can be recorded using a calibrated meter linked to a data logger. The test fluid usually used for absorbency testing consists of a solution of sodium/calcium chloride with an ionic composition similar to that of serum . For research purposes, it is possible to replace this solution with other test fluids such as calf serum. Whilst this more closely resembles wound exudate, serum is not used routinely because of cost and potential problems of microbiological contamination. In view of the problems previously experienced with strike-through detection systems based upon the measurement of changes in electrical resistance, an alternative method was devised which proved to be easy and trouble free. This consisted of a Psion Organiser II (Model XP) fitted with a Digitron Model SF10 Datalogger unit. The SF10 unit plugs into the top of the Psion II, and is a four channel unit capable of taking up to four external probes to measure temperature, pressure, relative humidity or voltage. 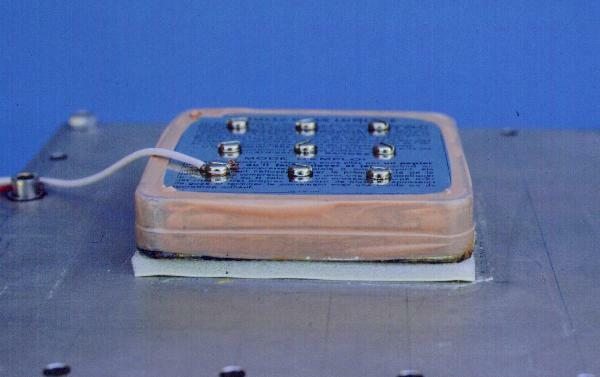 For the purpose of this study a voltage probe was used capable of recording from 0�2500 mV. A 1.5-volt (AA sized) alkaline cell was used to supply the necessary electromotive force. Preliminary validation studies showed that this combination provided a simple and reproducible technique for measuring strike-through, recording values that changed instantly from 0 mV to in excess of 1000 mV when strike-through occurred. Unlike the resistance-based systems used previously, there was no gradual change in reading, which made identification of the strike-though point difficult. The fourth component of the test system is the strike-through plate that is used to detect the presence of moisture on the outer surface of the dressing. In its simplest form this can be a piece of aluminium foil but a more acceptable alternative is a piece of copper-faced board such as that used in the construction of electronic printed circuits. A suitable weight applied to the back provides pressure, simulating the application of a bandage. The problem with this system is that by definition the board has to be placed directly upon the outer surface of the dressing under test. As such it will occlude the dressing and prevent the loss of moisture vapour, which would normally pass through the outer surface to be taken up by desiccant within the test chamber. This problem was eventually overcome in a novel way by combining in one piece of apparatus, the functions of strike-through plate, moisture absorbing unit, and pressure plate. A metal tin 10 cm 10 cm, previously used to hold paraffin gauze dressings, was adapted for this purpose. A large hole was cut in the base over which was soldered a fine metal mesh. A series of nylon spacers were bolted to the inner surface of the lid to act as spacers and press down on the upper surface of the wire mesh. The tin was then filled with silica gel and sealed round the edges with impermeable plastic tape (see Figure 5). with the addition of suitable weights it provides pressure to the outer surface of the dressing. 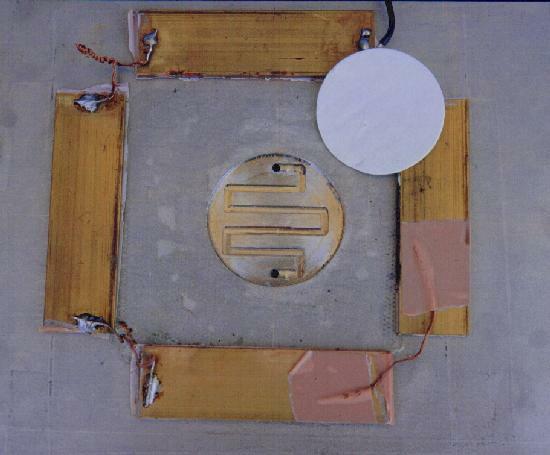 The detectors used to detect lateral strike-through consist of four brass strips each 90 mm 20 mm and 3.5 mm thick, connected together with short lengths of flexible cable (see Figure 7). The under-surface of each strip is covered with a layer of insulating tape to prevent it from making electrical contact with the stainless steel plate. 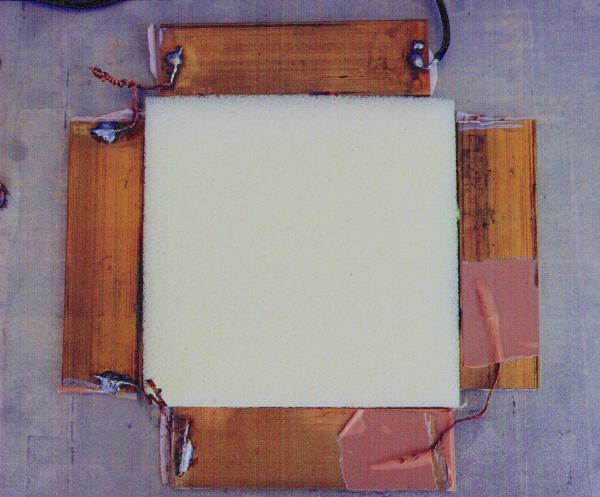 In use the strips, which are connected to the strike-through detector, can be pushed gently against the exposed edges of the dressing sample to detect any moisture that is transmitted laterally outwards (see Figure 8). Testing sheet dressings: When testing products such as hydrocolloid sheets, absorbent foam dressings or simple absorbent dressing pads, a filter paper is placed in the recess of the stainless plate and the dressing placed centrally over the top. The strike-through plate containing freshly dried silica gel is weighed and placed on the back of the dressing and a suitable weight is added to the back to produce the required level of pressure. This weight should also take account of the weight of the strike-through plate itself, but any small increase in the weight of this plate due to the uptake of moisture vapour during the course of the test is ignored. If appropriate, the lateral strike-through detectors may also be placed in position at the edges of the dressing. Both the strike-through plate and the edge detectors are then connected to the detection apparatus. Once the equipment has reached the required temperature, the balance is zeroed and the syringe pump, balance data logger and strike-through data logger are switched on. As test fluid is applied to the test rig, some will be taken up by the dressing. Any unabsorbed fluid will pass along the groove in the base of the recess and pass through the out flow pipe down into the receiver causing a change in the balance reading. The amount of fluid that accumulates in this way is inversely proportional to the absorbency of the dressing. A highly absorbent dressing may take up all the liquid that is applied to it, whilst less absorbent products will only absorb for a short time or take a little while to reach maximum absorbency. The apparatus may be calibrated by running blanks, replacing the test dressing with a totally occlusive non-absorbent film. This provides a measure of the dead volume within the system and an accurate measure of the flow rate, details of which are required for manipulation of the data. Testing hydrogels and cavity wound dressings: When testing cavity wound dressings or hydrogel dressings a simple modification is made to the apparatus. A piece of circular acrylic tube is fixed around the recess in the centre of the plate to form a chamber into which the dressing is placed (see Figure 9). Although strike-through measurements are not appropriate with such dressings, it is possible to apply pressure to cavity dressings such as alginate packing by means of a weighted piston, which forms a loose fit in the acrylic tube. In all other respects the test procedures remain the same. When testing hydrogel dressings, the open end of the chamber is sealed with a piece of aluminium foil held in place with impermeable plastic tape to prevent evaporation. Data manipulation: Balance readings recorded by the data-logger are downloaded into Excel (Microsoft) for analysis. An example of a graph produced from the raw data obtained with a hydrogel dressing is shown as the blue line in Figure 10. It must be recognised that this line actually represents the weight of fluid not absorbed by the dressing rather than the weight actually taken up during the test. In order to make the graph easier to understand and facilitate comparisons between different products, it is necessary to manipulate these data to calculate weight of fluid absorbed from the calibrated flow rate (the weight of fluid applied) and the time at which each reading is taken. This is done automatically by the computer using the simple formula shown below, assuming that 1 ml of fluid weighs 1 gram. In Figure 10 the green line represents the weight of fluid absorbed by the dressing and the broken red line represents the flow rate i.e. the total weight of fluid available for absorption by the dressing. For simplicity, only the converted absorbency values for each dressing will be included in subsequent figures. Interpretation of test results: Because the test system continuously records the weight of fluid taken up by a dressing over a chosen period for example 24�72 hours (typically 48 hours), it is possible to relate this information to the clinical use of the dressing. Reliable information on the amount of exudate produced by different types of wounds is not available, but in one study  it was shown that most of the leg ulcers examined, produced approximately 0.5 g of exudate /cm�/24 hour, a value that is in broad agreement with that reported previously for burns . A smaller number of ulcers, however, produced volumes of exudate that were approximately twice this value, (1 gram/cm�/ 24 hours). For the purpose of the current project, in the absence of any published information to the contrary, these two values will be taken to represent moderate and heavily exuding wounds. As it is also recognised that some wounds will exude less heavily than this, a third group of lightly exuding wounds will be defined that are arbitrarily assumed to produce only 0.25 g/cm�/ 24 hours. If these exudate rates are combined on a single graph with the absorbency profile of a particular dressing, it becomes possible, for the first time, to estimate how long the product may remain effective during normal clinical use. An example of such a graph is shown in Figure 11. This has been constructed from the data obtained with the dressing shown in Figure 10. This suggests that this particular product would only be capable of absorbing the exudate from a moderately exuding wound for about 12 hours, after which time it would become progressively less effective. On a lightly exuding wound, however, it could continue to function for up to about 48 hours. Importance of strike-through data: As the test is considered to have come to an end once strike-through has occurred, the time at which this takes place is noted from the data logger and the weight of fluid absorbed by the dressing determined from the appropriate graph at this time point. Before finalising the practical details of the test method, a number of different dressings were tested to examine the versatility of the test system and provide some indication of its ability to show differences both between and within groups of dressings some of which are considered to be interchangeable in use. The results of these initial investigations are shown below although the dressings used have not been identified. No repeatability testing was carried out at this stage. For convenience, the results are grouped together by product type in order to highlight the differences that exist between them. There is no reason, however, why all of these results could not appear on the same graph for comparison purposes as they were all obtained under the same test conditions. The first group of products to be examined was the hydrogel dressings. For the purpose of each test 30 g of gel were placed in the test chamber which was sealed to prevent loss of fluid by evaporation. It is recognised that in clinical practice it is unlikely to be possible to maintain this thickness of hydrogel on a wound of limited thickness but it may be more relevant to deeper or cavity wounds. The results are shown in Figure 12, and as before the weight of exudate that could be anticipated from both moderately and lightly exuding wounds over a 48-hour period is indicated on the graphs with broken lines. The graphs suggest that the ability of two of the gels to absorb liquid was very limited compared with three other products that absorbed significant volumes of test solution. One product that performed well initially, appeared to decrease in weight subsequently due, it is assumed, to washout of some of the diluted gel from the test chamber. A number of hydrocolloid dressings were then examined in a similar fashion (Figure 13). Once again the results indicate a considerable degree of variation between products. One dressing in particular virtually failed to absorb any test fluid during the course of the test. 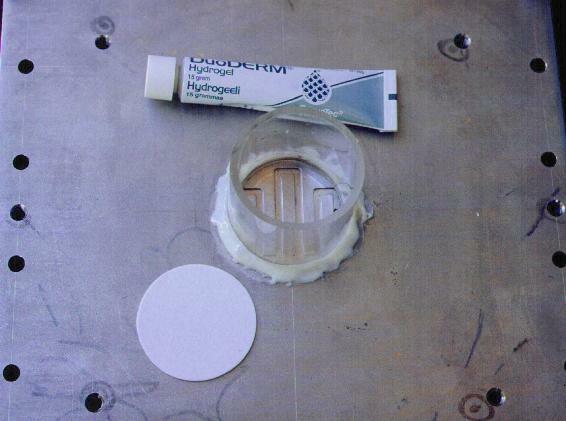 The results of two other dressings, a hydropolymer sheet and 0.75 g of alginate packing are shown in Figure 14. From this figure it may be seen that both dressings initially absorbed all the fluid that was applied to them. After about 6 hours the alginate became fully saturated but the hydropolymer continued to absorb test solution. The contribution made by the loss of moisture vapour to the fluid handling properties of the sheet dressings may be determined by measuring the change in weight of the silica gel in the strike-through plate. Typical values for the total loss of moisture vapour determined experimentally over a 48-hour period for some of the dressing tested is shown in Table 1. Once again the test system has demonstrated marked differences in the performance of the dressings examined in terms of their moisture vapour permeability. In the second phase of the test method development, designed to test the repeatability of the system, samples of an alginate sheet dressing were tested under three different conditions of pressure; uncompressed, compressed with a 50 gram mass and compressed with a 500 gram mass. Four thickness of dressing were carefully cut into circles that just fitted inside the acrylic tube attached to the stainless steel plate and the test performed as described previously. The average total weight of each set of four layers of dressing was calculated and found to be just less than 1 gram, (mean 0.88, sd 0.05). Three replicate results were obtained at each pressure loading (see Figure 15). These show that initially the dressing absorbs all the liquid that is applied to it but at a given point in time the fibres become saturated and the uptake of fluid ceases. The application of pressure has a marked effect upon absorbency, reducing both the weight of fluid absorbed and the degree of variability between results - a feature of the fluid handling properties of alginate dressing not subjected to any form of compression. Figure 15 - Effect of pressure on uptake of fluid by alginate dressing. The results of the preliminary tests described above suggest that the new method meets its two principal aims. Specifically it can be used to compare the performance of different types of dressings and provide an indication of the wear time of each on wounds of different types. However a number of problems and potential sources of error were also identified with the method during this initial phase. Initially the test system, including the wound chamber, was pre-filled with fluid by manually advancing the carriage of the syringe pump. This was then blotted dry with absorbent tissue leaving the test solution level with the top of the inlet port. A pre-moistened filter paper was then placed in the test chamber and the dressing applied. At the start of the test the syringe pump was switched on and the assumption made that the introduction of fluid would start immediately. The results of flow rate studies, not shown here, indicated that this was not always the case due to a degree of backlash in the pump and syringe assembly. This meant there was sometimes a lag period between switching on the pump and the introduction of test solution into the wound model. At the low flow rates used (generally 1 ml/h) it was considered that this time delay could represent a significant source of error. In order to overcome this problem, a change was made to the test procedure as follows. The test chamber is blotted dry as before and a dry filter paper placed in position under the dressing. The carriage is then advanced manually until the fluid approached within 5 mm of a mark on the capillary tube 10 mm below the entry port on the test plate. At this stage the pump is switched on and the position of the fluid monitored until it reaches the reference mark. This is taken as the start of the test at which point the balance is zeroed and logging is commenced. Some variability was also noted in the flow rate produced by the syringe pump, particularly when syringes were used repeatedly. A new syringe pump was therefore purchased to ensure a more consistent flow rate and new syringes used for each test. 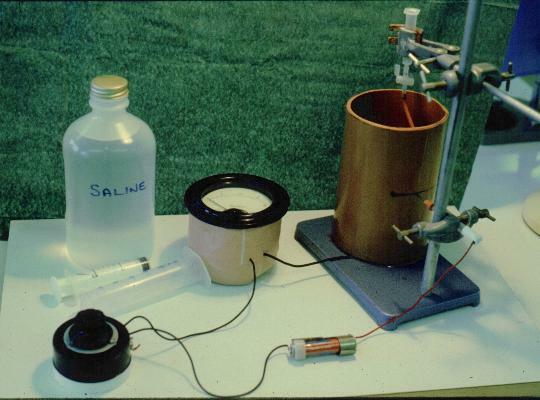 The actual flow rate of the syringe pump when set at 1 ml/hour was measured accurately by allowing the syringe to discharge directly into a container placed upon a balance. Three replicate determinations were made in this way and the flow rate was determined for each by calculation from the data recorded by the balance logger. In each case a graph of these data produced a straight line with a correlation coefficient greater than 0.99999, the slope of which represented the flow rate (Table 2). These results confirm that the pump performs in a consistent and reproducible fashion. Because the test procedure had changed, it was necessary to produce new blank values in order to determine the dead volume of the system. These were obtained by placing a piece of non-absorbent adhesive film over the wound model with a weight on the back and running the test as before. Three replicates were performed and the recorded data downloaded for analysis. Once again the slope of these curves represented the flow rate under the conditions of test, and from the intercept the dead space within the system could be calculated. In order to make some assessment of the repeatability of the test method in its final form, three samples of a hydrocolloid dressing were tested as described. The results are shown in Figure 16. A typical blank curve is also included for comparison purposes. During this test, strike through occurred with all three samples of the dressing after 607, 620 and 699 minutes which, from the raw data, corresponds to an uptake by the dressing of 2.33, 2.37 and 2.72 ml of fluid respectively. This was an unexpected finding, for hydrocolloid dressings are usually considered to form an effective barrier to the passage of liquid. Although strike through had also occurred during the initial phase of testing with this particular product, it had been regarded as an isolated incident or artefact but this is clearly not the case. The test results obtained during Phases 1 and 2 of the validation process must be interpreted with care as these were performed as part of the test method development and should not necessarily be regarded as being fully representative of the performance of the products examined. For this reason the identity of the dressings examined has not been revealed. However the results clearly indicate that the principal objectives of the project have been achieved in that a method has been developed which meets most if not all of the design criteria originally identified. The only remaining concern is the value of the measured dead-volume and further modifications to the apparatus are being considered in order to reduce this by changing the size and shape of the fluid channel. The final stage in the development of any test methods is the production of data to demonstrate its robustness in terms of repeatability and reproducibility. The limited repeatability results obtained thus far are extremely encouraging and these are currently being supplemented by additional test data. Reproducibility data will be obtained by making the equipment available to other test centres for them to repeat these tests in other laboratories using different personnel. One of the most important advantages of the technique is its ability to predict the likely clinical performance of a dressing in terms of its ability to cope with exudate over an extended period. Some problems remain, however. In the case of the hydrocolloid dressings, for example, Figure 7 suggests that this dressing would absorb about 10-11 ml of test solution over a 48-hour period. Whilst this may represent a reasonably accurate estimate of the amount of exudate sequestered by the dressing, it could represent an underestimate of the dressing's overall ability to contain exudate production in vivo. It is also known, however, that in vivo the formation of a sealed chamber over a wound can actually reduce exudate production  and this will further complicate the interpretation of the results. In the case of a large or circumferential leg ulcer, the application of a compression bandage would tend to force the dressing down onto the wound surface eliminating a large proportion of the dead space and reducing the overall fluid handling capacity of the product. This fluid retention effect would not occur with hydrogel dressings or alginate packing materials that conform fully to the shape of the wound. The inclusion of MVTR values in the total figure for the fluid handling capacity of a dressing may result in an unrealistically high estimate of the performance of that product. Although it is common practice to include such values when comparing the total fluid handling properties of different dressings, in clinical practice the amount of fluid that is removed by this means will probably be only a fraction of the value determined experimentally. Moisture vapour transmission is determined by a number of factors including temperature and the relative humidity (RH) gradient across the dressing. Under the experimental conditions used during the course of this study, there is liquid on one side of the dressing and a desiccant on the other which ensures that externally the RH is very low and as a result, the gradient is at its maximum. Under ambient conditions, the humidity at the outer surface will be much higher, and as a result the RH gradient and therefore the loss of moisture vapour will be reduced. In patients who are confined to bed or who have multiple layers of bandages on their legs, the relative humidity at the surface of the dressing might be expected to reach still higher values. In the absence of published information the temperature and humidity underneath the bedclothes of three hospitalised patients was measured using a calibrated temperature and humidity probe that gave results traceable to national standards. These indicated that on that particular occasion, the average temperature beneath the bedclothes was 26.5 (range 24.4� to -27.3�) and the average RH was 50% (range 47.3% to 51.7%). These findings suggest that the measured loss of moisture vapour through the dressings recorded during the course of the current laboratory investigation are likely to be considerably greater than would be encountered in practice. As such they probably represent a marked over-estimate of the fluid handling properties of the dressings under normal conditions of use. When comparing different dressings in this way, it may be appropriate to quote an arbitrary 50% of the measured MVTR value to provide a more realistic estimate of the amount of fluid transpired in vivo. The fact that the hydrocolloid dressings tested in Phase 2 consistently produced a strike through result was an unexpected finding. Further microbiology studies are planned to investigate this further. Despite the advantages offered by this new test system, it is recognised that important factors such as adhesiveness and wear time, skin irritation, and adherence of dressings to fragile tissue cannot adequately be predicted by this or any other test yet developed. Similarly one or more of the components of a dressing may have a profound effect upon the process of wound healing which may only become apparent in animal studies or clinical trials. New dressings are constantly being introduced to the market, many of which have unique or markedly different structures from those already in existence. Whilst it is accepted that laboratory studied alone cannot be relied upon to predict exactly how a new product will behave in vivo, such a test may provide some indication of its potential clinical benefits or shortcomings prior to embarking on expensive clinical studies. The test method developed during this study can, for the first time, be used to generate data on the fluid handling properties of most types of dressings and also enables some basic predictions to be made about likely wear time. This article was originally published in the Journal of Tissue Viability 2001, Vol 11, No 4, pages 145-60. The copyright of this article remains with the Tissue Viability Society. 1. Thomas S, Loveless P. A comparative study of the properties of six hydrocolloid dressings. Pharmaceutical Journal 1991; 247: 672-5. 2. Semipermeable hydrocolloid dressing. British Pharmacopoeia Addendum. London: HMSO, 1996; 1943-4. 3. Thomas S. Observations on the fluid handling properties of alginate dressings. Pharmaceutical Journal 1992; 248: 850-1. 4. Alginate fibre. British Pharmacopoeia Addendum. London: HMSO, 1995; 1705-6. 5. Alginate dressing. British Pharmacopoeia Addendum. London: HMSO, 1995; 1706. 6. Alginate packing. British Pharmacopoeia Addendum. London: HMSO, 1995; 1706-7. 7. Thomas S, Hay NP. Assessing the hydro-affinity of hydrogel dressings. J Wound Care 1994; 3(2): 89-92. 8. Thomas S, Hay NP. Fluid handling properties of hydrogel dressings. Ostomy Wound Manage 1995; 41(3): 54-56,58-59. 9. Farrar DF, Richardson MC. An in-vitro comparison of the performance of absorbent wound dressings (poster). Symposium on Advanced Wound Care, 1991; San Francisco. 10. Williams AA. Proficiency of contemporary wound dressings. In: Turner TD, Brain KR, editors. Surgical dressings in the hospital environment. 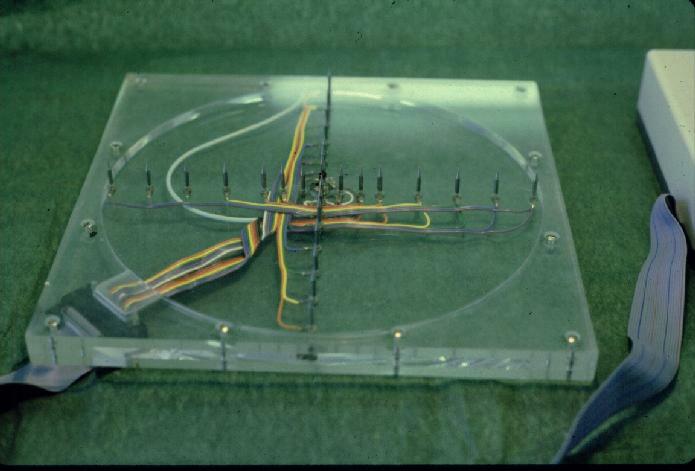 Cardiff: Surgical Dressings Research Unit, UWIST, 1975; 163-79. 11. Lanel B, Barthes-Biesel D, Regnier C, Chauve T. Swelling of hydrocolloid dressings. Biorheology 1997; 34(2): 139-53. 12. Sodium chloride and calcium chloride solution. British Pharmacopoeia Addendum. London: HMSO, 1995. 13. Thomas S, Fear M, Humphreys J, Disley L, Waring MJ. The effect of dressings on the production of exudate from venous leg ulcers. Wounds 1996; 8(5): 45-9. 14. Lamke LO, Nilsson GE, Reithner HL. The evaporative water loss from burns and water vapour permeability of grafts and artificial membranes used in the treatment of burns. Burns 1977; 3: 159-65.